The lead-screw product line offers an extensive array of non-ball lead-screws, anti-backlash nuts, and free-wheeling nuts for use as components in a motion system. 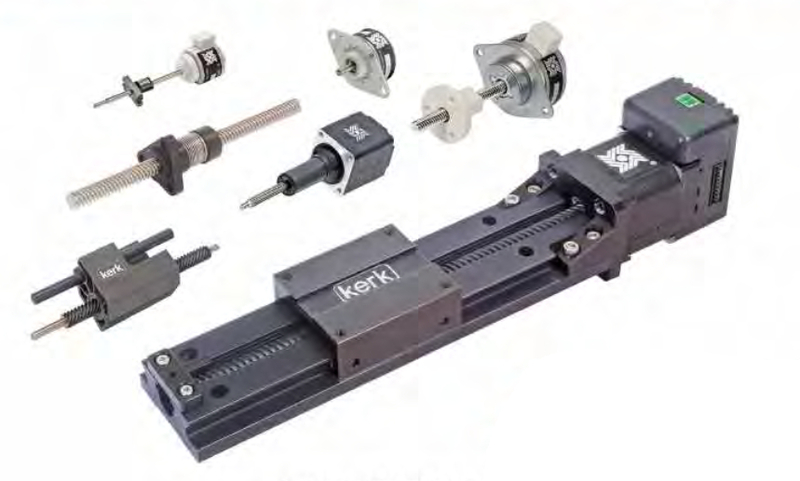 Haydon Kerk Motion Solutions offers precision lead-screws and nuts that easily interface to many types of rotary power sources including stepper motors, servos, brushless DC, brush-type DC, and AC synchronous motors. Lead-screws and nuts are also versatile components in systems requiring combination mechanics such as “belt, pulley, lead-screw” systems, and “folded-over” linear actuator designs. Lead-screws (charts on pages 19 to 23) Nominal screw diameter: 2 mm to 24 mm (5/64-in to 15/16-in) Leads (travel/revolution): 0.3 mm to 76 mm (0.012-in to 3-in)/revolution Nut Styles (product summary and charts on pages 24 to 26) 8 designs of anti-backlash and freewheeling nuts as a function of load and maximum allowable drag torque. ScrewRails® & Spline Shafts (product summary and charts on pages 45 to 54) Kerk® ScrewRail® combines both functions in a single, coaxial component. The design saves as much as 80% of the space used by a two-rail system. Kerk Spline Shafts provide anti-rotation for one axis motion or a drive mechanism with rotation for two axes of motion.